Coming off the back of reviewing Snake Roy for the Mega Duck we were curious to revisit The Supervision's own effort at adapting the most famous cell phone game of the 90's for the handheld market. Interestingly, this particular adaptation isn't another Sachen effort, but a game coded by British developer B.I.T.S, known chiefly for its Game Boy ports of the R-Type series. 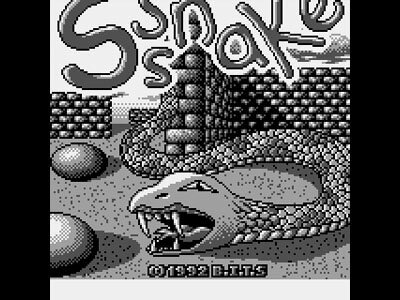 Sadly, Sssnake is a much less ambitious effort, content to reproduce the original mobile phone game's bare bones nature. Things start brightly enough, with an attempt at digitised speech and a decent looking title screen that offers the option to turn sound on or off with a press of select. This then devolves into a simple 2-d top down plain, with the developer, perhaps wisely, opting for a clear and basic gameplay field. The purpose, as it always is in these titles, is for your snake to eat all the goodies on screen (here limited to apples rendered as blobs and apple cores rendered as dog turds!) while growing one segment for every item it eats. Collision with the walls, or with your own tail, is fatal as are the little poison symbols which appear intermittently if ingested. Keeping things simple is sometimes for the best when it comes to the Supervision. Thankfully Snake is free from the perils of ghosting. Unlike Snake Roy, no effort has been made to take the experience anywhere other than it's arcade hi-score roots. Once your 3 lives are gone then it is game over and while the game will alert you to a new high score it doesn't even offer up the option to enter your name into a table as a reward. Of course, there is nothing fundamentally wrong with offering an old school hi-score puzzler that's entertaining for five minute intervals on a handheld like the Supervision. Unfortunately this kind of precision, twitch response gameplay relies on responsive controls which Sssnake, sadly, doesn't have. 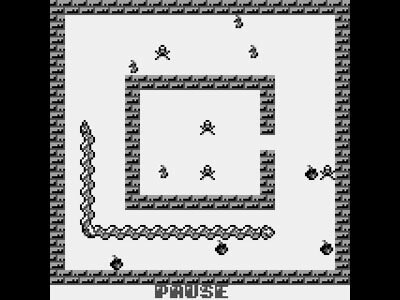 Whether it is the fault of the programmers or the Supervision's less than wonderful D-pad, you will die way to many times while playing this due to a lack of responsiveness in the controls, with the snake not turning despite a firm press in the required direction. 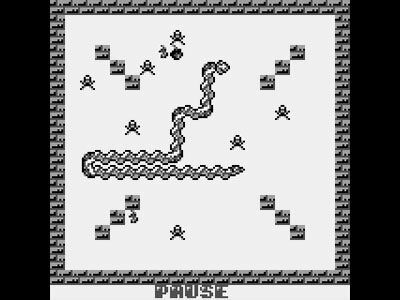 Unfortunately, with no other challenge beyond its bare bone presentation, this makes Sssnake not only an empty experience but an exercise in frustration rather than the simplistic, fun flashback that it could and should have been.